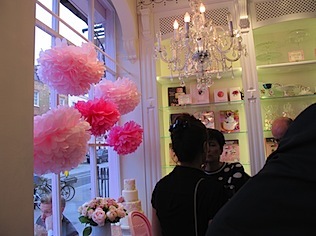 On Wednesday I attended the launch of Peggy Porschen’s new book Boutique Baking at the Peggy Porschen Parlour – a departure from her previous sugarcrafty books, Boutique Baking is inspired by the cakes on sale in the parlour. I have baked something from the book and will be blogging it soon alongside a more detailed review. 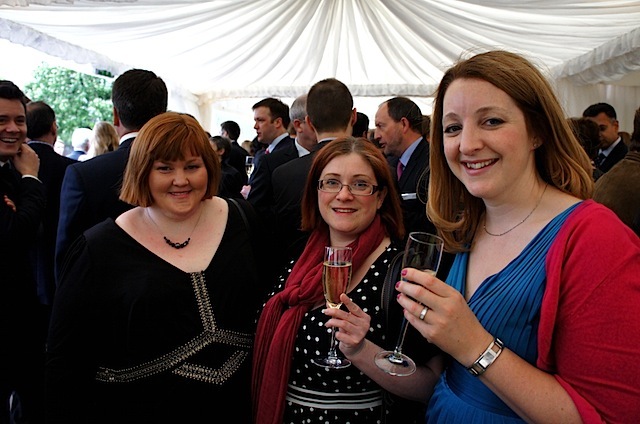 Thursday saw the star spangled Waitrose Summer Party take place this year at Kensington Palace Orangery. 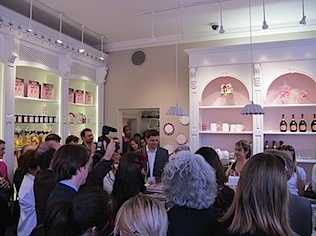 Those of us in attendence were slightly bereft at the absence of Heston but nonetheless it was a chance to mingle with foodie faces and journalists. The celebrity bingo score sheet this year ticked off Kirstie Allsopp, a twin from TOWIE (much to Katie’s delight), Fiona Cairns, Aggie Mackenzie, Gregg Wallace, Mary Berry, Eric Lanlard, Gizzi Erskine and many more. Donning glad rags and pinchy shoes, I enjoyed the even more glittering company of Katie, Michelle (shown with me in photo above), Helen, Ren, Andrea, Gail, Jules and Kirsten. Quote of the night: “I must swig beer from bottles on the drive to Kensington Palace more often”. Personal highlight of the night, admiring Rachel Johnson’s white jeans clung bottom in the private viewing of the State Apartments. No offence everyone but all the other events during the year are a let down after this. Lurpak are promoting a new service powered by online music streaming service Last.Fm called Food Beats which allows you to select music according to whatever you are cooking. I typed in something obvious and it just diverted to a drop down menu of music style by country which in essence is how it works. You aren’t given an option to retype your dish, so far as I can tell it doesn’t recognise anything and just gives you the drop down menu by country. I wasn’t convinced the French selection would get you in the mood though – too much Boris Vian and Jacques Brel giving a miserable representation of French music. On the plus side it’s a cool way to access Last.fm without the hassle of installing it. The only dish I could get Food Beats to recognise was flipping pasta which bafflingly suggested Marina and the Diamonds. Weird. See if you have more success with your chosen cuisine at Food Beats. Heston Blumenthal may not have been at the Waitrose Party but he has been busy putting his mark on a new range of Heston Blumenthal Kitchen Knives at Grunwerg. I have been using the paring knife recently and it’s turned slicing onions and carrots into a strange pleasure. The knives have the design of Heston’s favourite Japanese Tojiro knives but are a more accessible price range between £20 and £50. Find out more at Tojiro. I have downloaded Kenwood’s Kitchen Recipe app (available for iPhone and iPad) which gives inspiration how to make the most of their kitchen gadgets as I recently experienced at L’Atelier des Chefs. 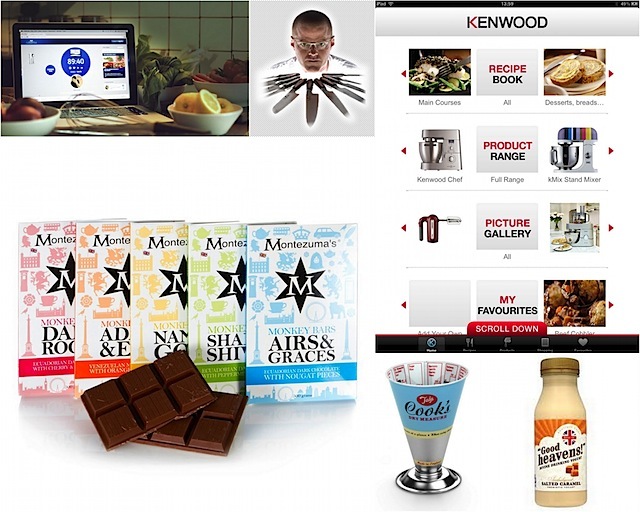 The app features 80 recipes and the ability to share these on social media or add their ingredients to a shopping list. You also get the chance to ogle their full product range (hello Cooking Chef :-)) and watch videos of them in action. Find the app at iTunes. Good Heavens! is an off the wall name for a brand of yogurt but I wasn’t complaining when six bottles of their drinking yogurts turned up out the blue by courier. Salt caramel, is in my opinion, becoming something of a check box flavour for brands but was my favourite above their apple and lemon/poppy seed varieties. Stocked by Tesco, or more impressively, Harrods and Selfridges, find out more at Good Heavens. Tala the vintage kitchenware brand have retro accessories to get you into the 1950s mood during the iminent jubilee baking frenzy. Check out this conical measure which allows you to see at a glance how much your dry ingredients weigh in metric, imperial or US cups as well as more specific gauges for common food stuffs like sugar, rice, lentils, oats or raisins. Available from Amazon or John Lewis. Montezumas not content with their Great British Pudding Bars featured in my recent Jubilee Shopping Guide have brought out the Monkey Bar – named after cockney rhyming slang for “500”, each bar weighs a whopping 500g and is bigger than an iPad. They’re gigantic, I cannot tell you. Eating one by yourself would be silly – far better to take a bar to a party and it will be an instant talking point. Keeping in with the cockney references, the packs feature landmarks from the London skyline with flavours named “Nanny Goat” and “Adam and Eve”. RRP £13.99 each – which is far cheaper than an iPad – find out more at Montezumas. 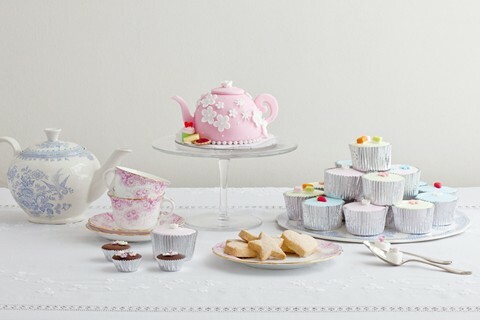 Times Jubilee Baking Competition – judged by Alice Hart, closes 29th May. Easy Living Magazine Cake Off – judged by Eric Lanlard and royal wedding cake maker Fiona Cairns, closes 1st June. Home Made by Fleur jubilee baking contest sponsored by Appliances Online, closes 3rd June. With thanks to Waitrose, Lurpak, Grunwerg knives, New Zealand Honey Co, Good Heavens, Tala and Montezumas for sample products. Crikey, you have been busy. The Waitrose summer party sounds like a fun event and I WANT one of those Motezuma 500g bars! Great round-up of events and stuff – thanks. This week’s events have been fab! 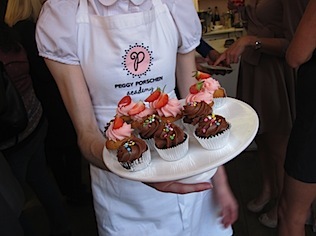 I had so much fun at both Peggy’s book launch and the Waitrose party – I still really have no idea why Heston wasn’t there – despite having his salted caramel popcorn included in the goody bag (which I just polished off the last of!) There was no Delia either…. Love your round up as well. I’ll have to give entry into some of the baking contests some consideration. I do have an entry for Karen’s tea time treats this month though.. Thanks to the Waitrose party I now have a very high standard for cocktails and parties! It was lovely to meet you. Wow you have been busy! Jealous to hear about the Waitrose party – that was always a great one to go to. Lots of celebrity spotting! wow looks like you’ve been a very busy bee indeed! I wanted to go to Peggy’s book signing but couldn’t make it in the end 🙁 Can’t wait to see what you’ve made from her book! Was lovely to see you all the other night – through the crowds! Ooh what did you bake from Peggy’s book? I’m posting the sticky toffee cupcakes next week…so incredibly delicious! The white chocolate passion cake! To be blogged soon! Sticky toffee cupcakes sound great! Thanks so much for the mention. Loved your round up of events and products. You must have got a lot ticked off your ‘to do’ list after writing this post ;-). 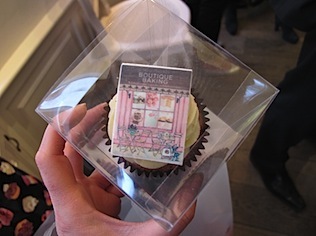 My ambition for next year…get myself an invite to the Waitrose Summer Party!